Perhaps the best objects to have in your household are objects that have both value as gorgeous decorations and are incredibly useful tools. A good example of this that many people might discredit at first is the wine decanter. It is easy to put wine decanters in the same group as decorations, but a good wine decanter can completely change the tone of a party and up your entertaining game as a host. A wine decanter can add a sense of sophistication to your table, and change how you drink wine both in company and relaxing alone. 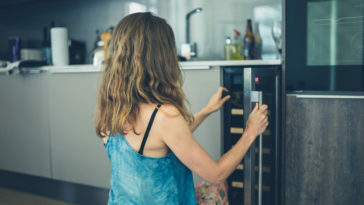 However, perhaps you are among a number of people that don’t quite know what to do with a wine decanter other than put it on a shelf where the artful curves might be admired. In that case, keep reading to understand what the wine decanter has to offer. 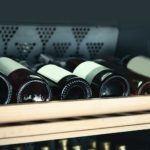 On the other hand, perhaps you’ve already realized that a wine decanter is a must have for your household and you simply find the you are lost sorting through a variety of wine decanters, trying to find the one that fits you best. 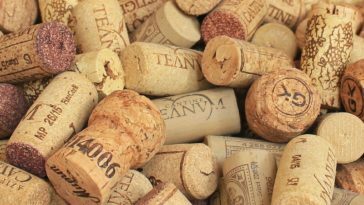 This article will also demystify the art of choosing the right wine decanter for you or your loved ones. 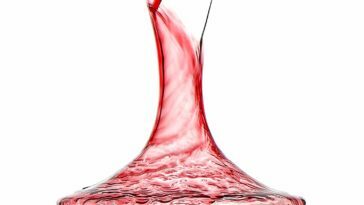 What is a wine decanter used for anyway? Wine decanters are much more than decorative. 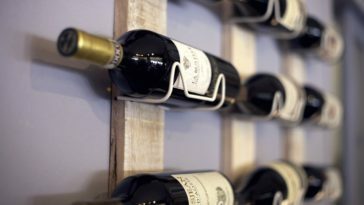 Although the majority of decanters cut a sharp image when stored on a shelf, their true purpose is in creating a better wine to be served. 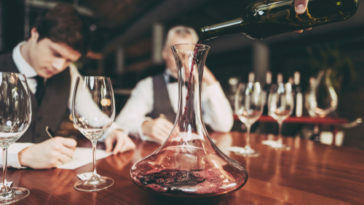 Whether you find yourself serving a wine that’s a few decades old or a younger wine that is simply tight on the nose and palate, a wine decanter can change the experience for the better. 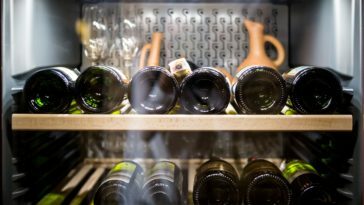 The point of a decanter is to trap the sediment in the bottom of the bottle, resulting in a clearer wine in the wine decanter and ultimately the wine glasses on your table. 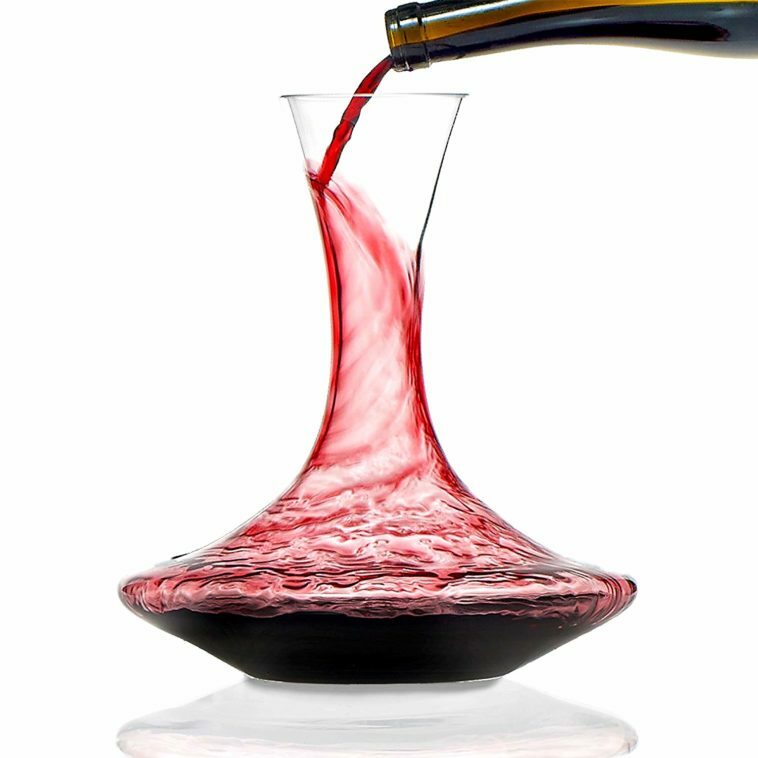 However, a much more common reason to use a wine decanter is to aerate the wine. Aerating the wine in a decanter makes the full flavor of the wine come out. There are certain rules when it comes to using a decanter to let your wine breathe. 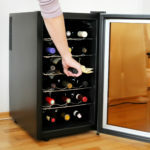 More mature red wines – which more or less means a red wine that is over eight years old – do not need to breathe as much, and it is generally advised that you only put the mature red wine in the decanter thirty minutes before serving at most. 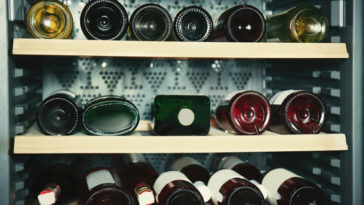 Younger red wines – which are most red wines that are under eight years old – are strong in tannic acid and need to sit in the wine decanter for one to two hours before serving. 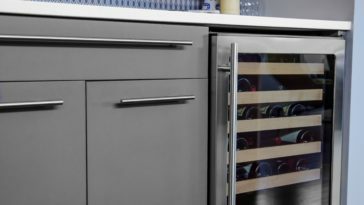 You can even decant some white wines to unlock the full flavor profile before serving. A decanter is more than just a fancy way to serve your wine. A decanter can change the entire experience of your wine, as well as add elegance to the table. A good decanter will bring out scents and flavors that are often hidden until they get the opportunity to breathe and open up. Buying a decanter for your table can be a daunting task to undertake. These three decanters are excellent starting points to consider in a search for the perfect decanter. Like all things, there might be a surface resemblance between the three but the minute details paint each decanter in a unique light. Choosing the right decanter often comes down to a matter of personal preference and stylistic preferences. 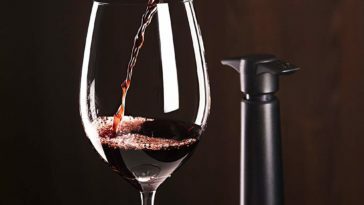 You will find that different decanters will aerate the wine in different ways and illicit different levels of aroma and taste in your favorite wines. 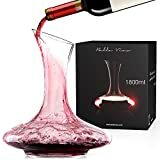 The Bella Vino decanter is simple to use and will have you decanting wine like a master as soon as you open the package. Made entirely of hand blown lead free crystal class, the wide base is excellent when it comes to decanting wine. Making a lovely table centerpiece when not holding a standard bottle of wine, this decanter enhances the look of your dining area as well as enhancing the taste and smell of your wine. Easy to clean, this decanter makes a fantastic gift for any time of the year. 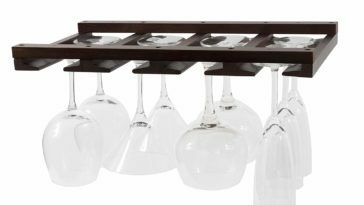 It easily enhances any bottle of wine you serve. The Bella Vino decanter is an excellent starting space if you are just learning about wine and decanting, and an easy and stable staple if you happen to be more experienced in terms of wine drinking. The decanter has a wide mouth to help with aeration and cleaning. 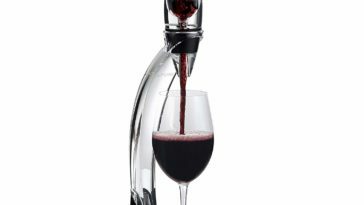 The Bella Vino decanter creates an elegant and luxurious feel out of any bottle of wine or beverage. The decanter feels hefty, making it less nerve wracking when it comes to a fumble when picking it up. 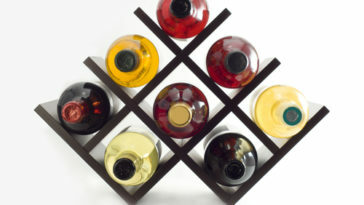 The decanter is simply gorgeous to look at, and makes an easy artful addition to any entertaining area. The decanter is hard to pour from, and often needs to be completely upended to get all of the wine poured, which is incredibly messy. 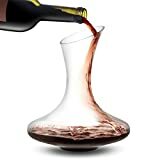 This decanter is far from spill proof despite otherwise stated. The Lancia decanter from JoyJolt is an elegant decanter that is designed for maximum aeration. Boasting a sharp modern cut, this decanter is made of lead free hand blown crystal. Elegant, durable, and built with quality in mind, this decanter makes an excellent addition to any party you happen to be hosting. The decanter is even easy to clean as it happens to be dishwasher safe! 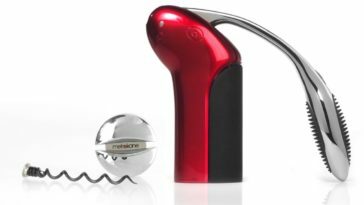 The Lancia decanter makes an excellent gift for any wine lover that you know, or an excellent addition to your entertaining kit for parties in your own home. This decanter is beautiful in any setting and adds a touch of elegance to the table with ease. The company has excellent customer service and works rapidly to fix any issues that you voice to them. This decanter is incredibly affordable despite the fact that it looks and feels like a much more extravagantly priced decanter. 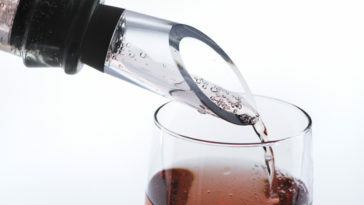 The decanter is rather durable and can withstand repeated use without much worry. Being hand blown, the thickness and levelness of the decanter can vary in annoying ways. The lip of this decanter is very fragile and tends to chip rather easily and without much noticeable rough handling. It is difficult to pour from this decanter without spilling, making it less appealing due to the mess that it creates over time. 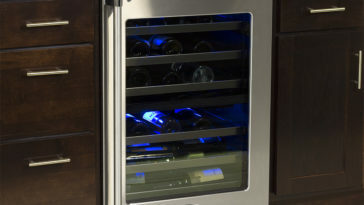 Le Chateau will happily become the perfect home for your decanted wine. Made entirely of lead free crystal, this decanter is both incredibly elegantly crafted and designed to hold 750 mL of wine in a way that allows for maximum aeration. With a wide neck and wide base, the decanter is incredibly easy to take care of when it comes time to wash it. The decanter is dish washer safe, but it is recommended that you hand wash it anyway just to be on the safe side. Use dish soap and warm water to clean the decanter, and leave it upside down to dry. This decanter makes an elegant and popular gift for a wine loving friend or loved one, or the perfect addition to a personal bar. Excellent for new wine aficionados and established winos alike, this decanter is an excellent choice to buy and is sure to please your palette given the opportunity. 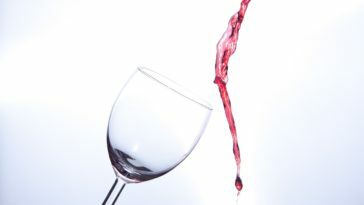 The slanted mouth allows for every drop of wine to be poured. This decanter is easy to get clean despite needing to be hand washed. The decanter dries quickly and without many spots. The company that produces this decanter offers a lifetime warranty on it. The decanter tends to stain easily. Being hand blown, this decanter has air bubbles and other minor blemishes that can ruin the appearance of the decanter.